Star Armie Hammer, director Luca Guadagnino & novelist André Aciman on Call Me by Your Name's passionate road to the screen. Is there a sexier book than Call Me by Your Name, André Aciman’s 2007 paean to eros awoken during a sultry, sensuous Italian summer? “This novel is hot,” wrote Stacey D’Erasmo in the first line of her review for The New York Times, echoing the sentiments of the book’s legions of fans for whom it quickly became a touchstone of adolescent gay longing with a satisfying twist—one often denied in our coming-out narratives: Desire is rewarded; hunger is sated. Boy gets boy. 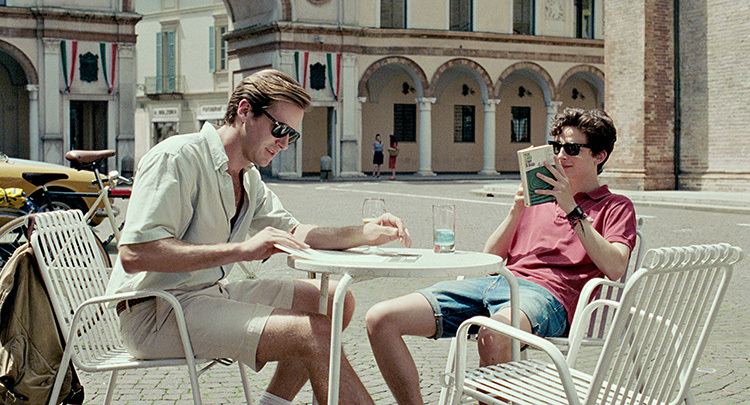 In the novel’s most famous scene, boy also gets peach—a kind of dry run for what the narrator, Elio Perlman, fantasizes about doing with Oliver, a research assistant staying at his family’s summer villa on the Italian Riviera. It’s a gift for the audience, too. To borrow from D’Erasmo, this film is hot. Much of it takes place around a pool, and the camera is not bashful, lingering on the tuft of hair below Oliver’s neck or Elio’s lithe, glabrous body with the same tender pleasure with which it captures a sleepy town square in the golden light of a late summer’s day. The sumptuous cinematography by Sayombhu Mukdeeprom conjures heat, sun, skin, scent. As in the book, you hear the hum of the cicadas, smell the pine sap. Who wouldn’t fall in love in such an enchanted place? “I think location is character,” says Guadagnino. “I really aim for portraying it in the most precise way.” As a result, the movie thrums with the nostalgic tug of time and place in keeping with the novel’s Proustian spirit, and its period, 1983. “Luca is without doubt the most epicurean individual I’ve ever met,” says Hammer. “He flows through the ether as if he wants to consume and make love to everything.” And, like the epicure he is, Guadagnino takes his time, allowing the intimacy to build gradually into a crescendo, swept along by Ravel’s deeply romantic “Une Barque sur L’Ocean,” and a set of lovely new songs by Sufjan Stevens. When, in a provincial town on the eve of a wrenching separation, the two men find themselves in a small bar dancing to the Psychedelic Furs’ “Love My Way,” you can be forgiven for feeling that you, too, had just relived the whole tumultuous experience of first love. While true to its spirit, the sweetly giddy bar scene is not drawn from the book. Instead it’s a musical madeleine from Guadagnino’s own youth. 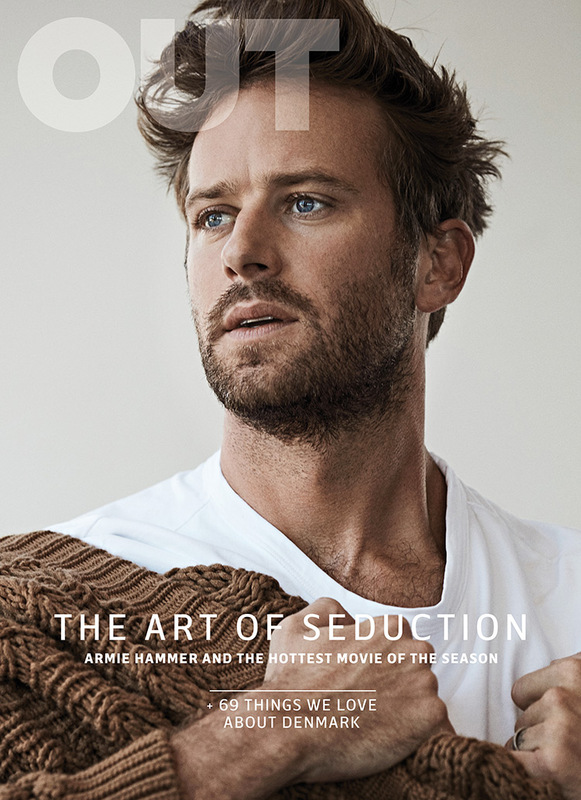 “I’m not trying to make people weep, but I didn’t dance with an Armie Hammer,” he says. “I danced by myself in my bedroom.” There are movies, after all, and then there is real life. Yet, asked how difficult it was to be a young gay man in 1980s Italy, Guadagnino, who was raised in Ethiopia by his Algerian mother and Sicilian father before moving to Palermo, is nonchalant, almost contrary. “It wasn’t difficult at all,” he says. “I never had to do any coming out because I was always myself.” The third child of five, he says his family left him largely to his own devices. “I grew up worshipping artists who were fiercely and dangerously themselves—Truman Capote, Rainer Fassbinder—and with them it wasn’t about ‘don’t ask, don’t tell.’ It’s about punching you in the face because I am an individual and a wild card in my own self—I don’t belong to a repertoire of behavior that I need to stick with.” He was reading Thomas Mann’s Buddenbrooks at the age of 12, and its literary aestheticism continues to influence his work today. Of course, one reason small movies don’t become big movies is that they take artistic risks. Call Me by Your Name could have been a more chaste film, but also a very different one. “If we were super worried about that stuff, we’d have made a lot of changes in the script years earlier and probably got the money to make a much more inferior film,” notes Spears. Yet making the movie was not easy. After Spears secured the rights in 2007, the project idled in limbo, caught between the need to shoot in Italy during the summer and capricious schedules. Three sets of directors and writers were attached before Guadagnino took it on. “Almost every summer there was an incarnation of the movie that would come together in the winter, be on the runway by spring, and then inevitably something would happen and the whole thing would fall apart for another year,” recalls Spears. It’s no coincidence that the script was written by James Ivory, who made his own contribution to the coming-out genre as the director of the 1987 movie Maurice, based on E.M. Forster’s novel of the same name. Forster only allowed Maurice to be published after his death, but what’s remarkable about the book is Forster’s insistence on a happy ending: Those outside of the closet fare better than those locked in. When it was published, many critics attacked it as unrealistic, but Forster’s optimism seems prescient now. Despite the initial shame that Elio feels after consummating his desire for Oliver, we know that he, too, will flourish by embracing the fullness of his identity.